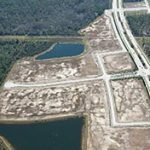 FORT MYERS, Fla. (Feb. 20, 2018) – Morris Depew and Associates, Southwest Florida’s premiere civil engineering and land use planning firm has completed work on Meridian Center North, the first facility in the Meridian Center project slated to break ground this month. Developed by Knott Realty, the 200,000-square-foot manufacturing and distribution facility located on 15 acres at 10400 Meridian Center Parkway in Fort Myers will be equipped with 32-foot ceilings, multiple drive-in and loading dock doors and parking accommodations for more than 350 vehicles. Morris-Depew Associates worked closely with Knott Realty to provide site design and land survey and mapping services, including constructing staking and final platting. Led by Partner Ryan Shute, the team also provided infrastructure zoning and permitting services to ensure approved usage of the site for commercial use.